France’s financial markets regulator, the Autorité des marchés financiers (AMF) is one of the most vocal and active watchdogs when it comes to informing and warning investors on the multiple risks associated with online trading, including trading binary options. It does so not only through the regular updating of its black lists of forex and binary options unauthorized brokers, on which we frequently report, but also through other means such as its recent Mystery Shopper Campaign which revealed many malpractices and shortcomings by several online brokers, most of whom were regulated by its Cypriot counterpart the Cyprus Securities and Exchange Commission (CySEC). In the most recent twist of events, the AMF has issued a warning against a website which it accuses of misusing its own name and logo in an inappropriate and misleading manner. 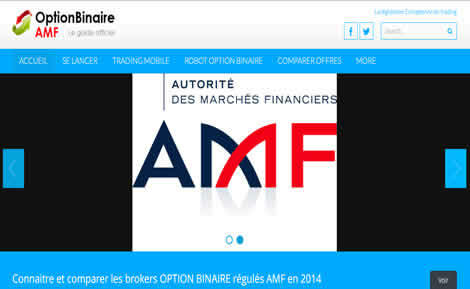 The site in question, is www.optionbinaireamf.com, which is only available in the French language and thus appear to be targeting French or at least French speaking traders, trying to convince them to open accounts with a number of Cyprus-based binary options brokers that it is actively promoting. Although claiming to be an independent guide which compares, through tables, as well as provides information on various “trusted and reliable” binary options brokers, all the brokers being actively promoted by the site are CySEC regulated entities. What AMF protests the most is the inclusion of its own name in the name of the said side, attempting to imply a direct or indirect connection between the two or the endorsement of the site’s content by the French regulator, as well as the fact that www.optionbinaireamf.com also uses a huge logo of AMF on the website’s homepage, trying to create impressions pictorially as well. Therefore, the AMF clarifies that it has nothing to do with “Option Binaire AMF” and advises the public to stay away from this website, only stressing the fact that any use of the French regulator’s logo and name in any way that may be misleading the investing public is illegal and will be treated as such by the watchdog.